The Ivy House has bus stops for 484 and 343 nearby. Nearest Stations are Nunhead and Brockley which is well-served by trains from Highbury and Islington, Dalston Junction and London Bridge. 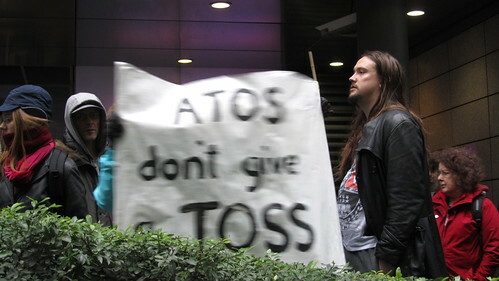 On Wednesday 22nd May the Judge Upper Tribunal handed down a historic judgement which officially confirms what survivors and disabled people have been saying for years now, that the hated ATOS tests are unfair. Individual survivors brought the case supported by the Public Law Project, the Mental Health Resistance Network, MIND, Rethink and the National Austic Society. Survivors, mental health service users, the mental health voluntary sector and the wider Disabled People’s movement are celebrating a famous victory in the Courts. This is at a time following the Banking and Corporation Tax Crisis, when everything seems stacked against them and the odds seemed insurmountable. Admission : £5 / £2 concessions. 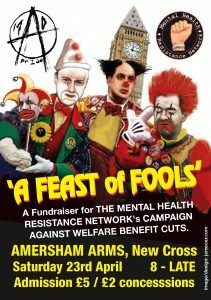 A Fundraiser for the Campaign Against Welfare Benefit Cuts. MAD PRIDE -The mental health rights campaigning organisation, that uses music and the arts to get our message across, are seeking to continue the successful and positive working relationship we have developed with TOTTENHAM CHANCES – the genuinely grass roots community and arts centre that does fantastic work with homeless people and people with mental health issues, by staging another event there on FRIDAY 12th OCTOBER which will continue our long established tradition of staging a ‘Celebration of Creative Lunacy’ to mark World Mental Health Week, with this years event marking the 9th Anniversary of these. Up to now these events which have been something of a ‘movable feast’ taking place in different venues over the years, mainly around South London – This event will be the first of these to take place in Tottenham where we have building our reputation and an audience following from a series of successful events there over the course of this past year. 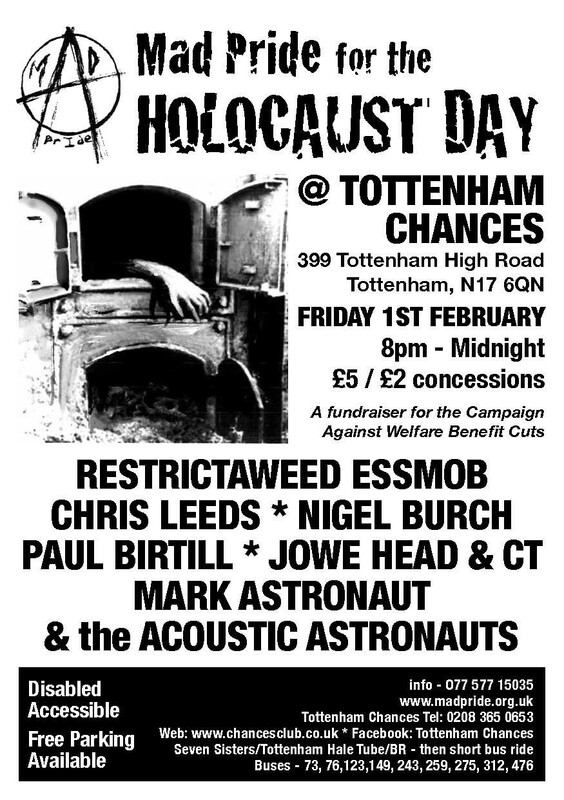 Back in February we staged the fifth of our annual events to mark the Holocaust Memorial, in recognition that people labelled as ‘mad’ were amongst the first to be exterminated in the concentration camps, at Tottenham Chances. Following from the success of this we have since gone on to stage a couple of well received Sunday all day events there, -the ‘Gathering of Nuts’ in May, and the recent highly successful ‘Paranoid Olympics’, staged as a sort of alternative closing ceremony for the Paralympics on the 9th September, and protesting the hypocrisy of Atos Healthcare the company responsible for causing so much distress and misery for disabled people by their operation of the much criticised Government ‘Work Capability Assessments’ being made a sponsor for the Paralympics. 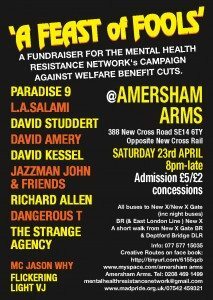 Tottenham Chances are keen for us to stage more regular events at the venue, we had been looking for a venue to stage our annual ‘Celebration of Creative Lunacy’ to mark World Mental Health Week in October and so, at fairly short notice this date was confirmed. Like all of the events we have staged over the past couple of years, any monies made, over and above basic running and publicity costs, are used to finance MAD PRIDE’s campaigning and awareness raising work and to help us to provide support to vulnerable people with mental health issues who have been having difficulties with their benefits due to the Government welfare ‘reforms’. We have even been able to make small donations to other disabled campaign groups like Disabled People Against the Cuts, with who we are affiliated. We are grateful to Chances for the donation of the use of their venue and facilities, without which these events could not happen. We are also very grateful to all the artists, technicians and other volunteers who donated their services for free or for basic expenses. MAD PRIDE has no funding or sponsorship and is entirely dependent on goodwill and the small admission fee we ask of the audience plus any donations. We have maintained a policy of keeping our admission prices low (still set at 1980’s prices)- to ensure they remain accessible to people struggling on benefits or low income. MAD PRIDE have established a reputation for staging original and high quality acts, our reputation amongst artists means we often have artists with an established ‘name’ or reputation offering to perform at our events. You just can not find better ‘value for money’ for your £5/ £2 entry fee – all this and the knowledge that monies made are going to an important and otherwise underrepresented cause. Chances has a reasonably priced bar, it is located nearby to bus stops with many buses running there from all parts of London, including night buses. It is close by to Tottenham Hale and Seven Sisters tube and BR stations. There is free parking available and the venue is fully disabled accessible. Also invited back to appear at the ‘Paranoid Olympics’ after ‘wowing’ the audience at the ‘Nuts in May’ event, but due to circumstances sadly unable to perform on that day -so we have invited her back again in the hope that this time we may actually have the privilege of seeing her perform for us again- is the deliciously delirious Cam Tan aka CT in her manifestation as VOODOO CiTi – for this gig she is threatening to bring some ‘heavy’ friends to accompany her and ‘bring the noise’. CT is well known and much loved and respected from her own gigs, gigs with her band ‘Anakzeus’ and for her role as the driving force behind the RAW Poetry events and workshops that run regularly in various London venues. We are pleased to welcome back the dexterous and erudite antipodean singer songwriter Chris Ramsing aka THE SON OF PSYCHO YOGI – who has made several appearances at previous MAD PRIDE events, most recently at the Holocaust memorial event at Tottenham Chances- Chris is another highly respected performer on the small gig scene in London with his incisive and thoughtful lyrics and polished delivery. Also welcome back to the Tottenham Chances stage albeit under a new name, are the edgy jazz tinged combo now known as I AM MEAT, who have formerly performed several times at previous ‘Survivors Poetry’ events there under their previous name, the enigmatic ‘The Protagonists of David Gadsdon’, where we saw them first and were duly impressed. Having built a solid reputation from gigs around London over the past year or so, and now in the process of recording an album, this marks there first appearance at a MAD PRIDE event and we are pleased to have their involvement and support. We have also invited some special guests who will remain unannounced until the night. As usual our MC for the proceedings will be the irrepressible JASON WHY. We hope to see you there on the night, which as usual promises some top acts or at one of the events we will be planning up for the future at this venue. 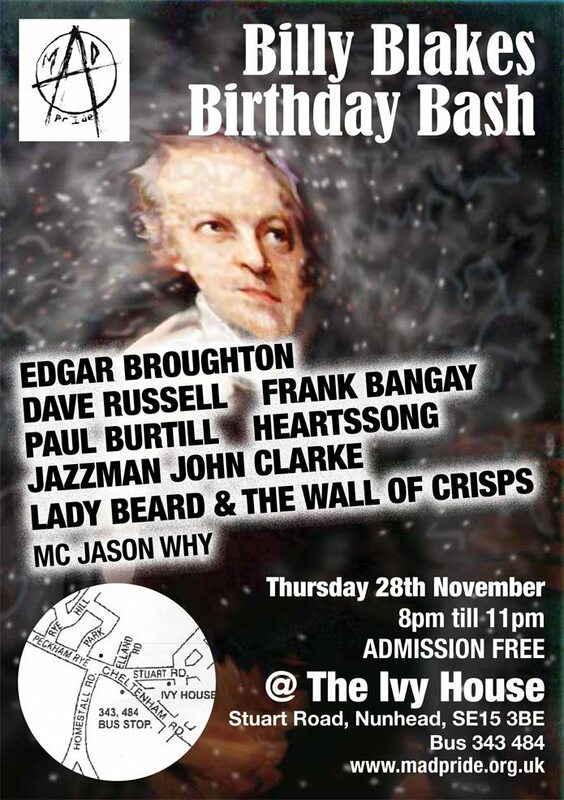 We are currently planning a special event to mark the birthday of Britain’s favourite ‘mad’ poets and artists with our annual ‘Billy Blake’s Birthday Bash’ in late November (another established MAD PRIDE ‘tradition’) and we have already invited some very special guests for this. Keep watching this space for more on this. Tottenham Chances 0208 365 0653.